I've recently found the most incredible range of crispbreads and am now totally addicted. 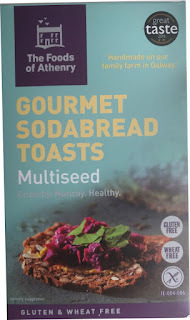 It was while browsing around a local health food store where I was scanning the shelves for new snacks, that I spotted these crispbreads from Irish bakery ‘The Foods of Athenry’. I've never heard of this company before, but that's one of the great things about independent health food stores – they give smaller companies a chance. Gourmet Sodabreads are available in four different types Multiseed, Cranberry & Hazelnut, Honeyed Almond & Rosemary and Multiseed with Cumin, The sodabreads have between 9 and 16 calories each. 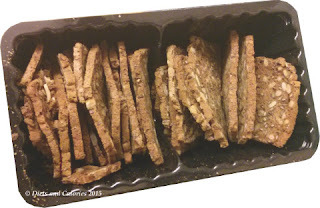 Some of the crispbreads I looked at had extraordinarily high amounts of calories. Healthy they may be, packed with nuts and seeds, but it does end up turning some foods into a very nutrient dense snack. However, these soda breads are wafer thin, so that helps keep the calories down. I’ve reviewed many crispbreads over the years, and mostly it’s those such as melba toasts which have the lowest calories. But they can be a little on the plain side and you really need to top them with something. Not so with these sodabreads. They are utterly delicious all on their own. I did start off dipping them into houmous, but found the houmous taste got in the way of the sodabread taste. So now I just eat them on their own. My favourite is the multiseed variety. 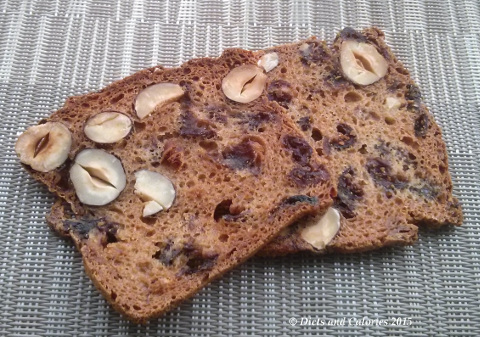 Each slice is crammed with sunflower seeds, pumpkin seeds and linseeds. They have an almost sticky feel to them but they’re super crunchy. I find once I’ve opened a pack, it’s hard to stop munching on them. I've also tried the Honeyed almond & rosemary. 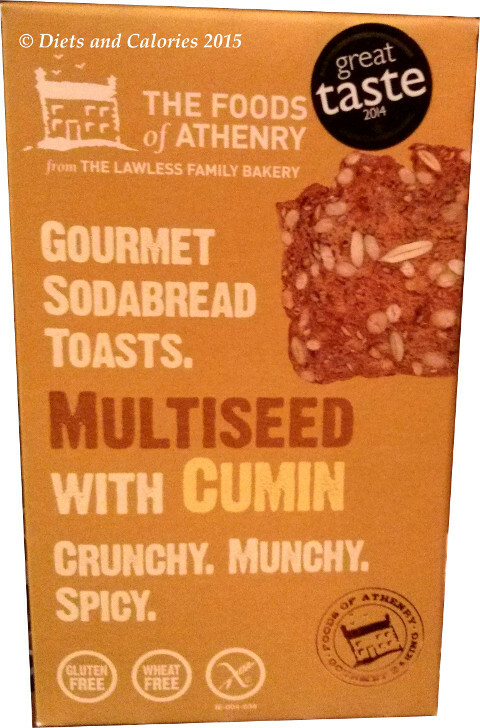 These have huge slices of almonds in each slice, but I found the herby taste a bit too strong for my liking. I've also tried the Cranberry Hazelnut, which are also super crunchy and have a slightly sweet taste. 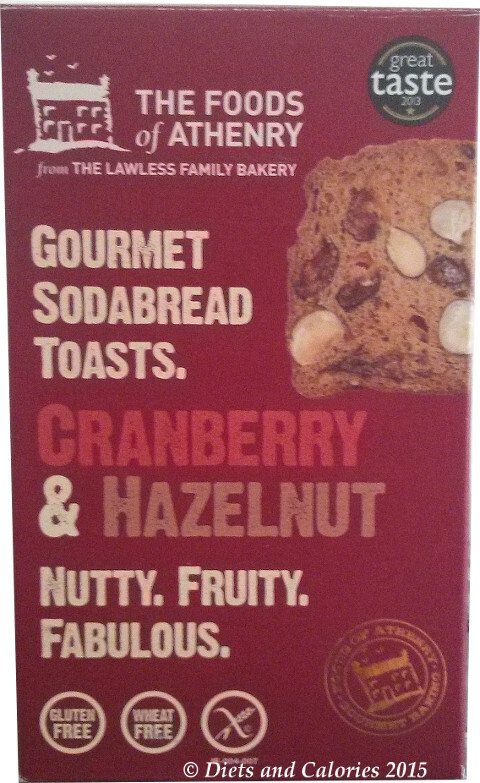 It seems I'm not alone in loving the taste of these sodabread. The Multiseed variety won a 'great taste 2012’ award and the Cranberry & Hazelnut won a ‘Great Taste 2013’ award. They are quite expensive, £3.29 for a 110g box of about 20 slices. However, I eek them out over around 3 days, so just over £1 a day isn’t too bad for a snack. 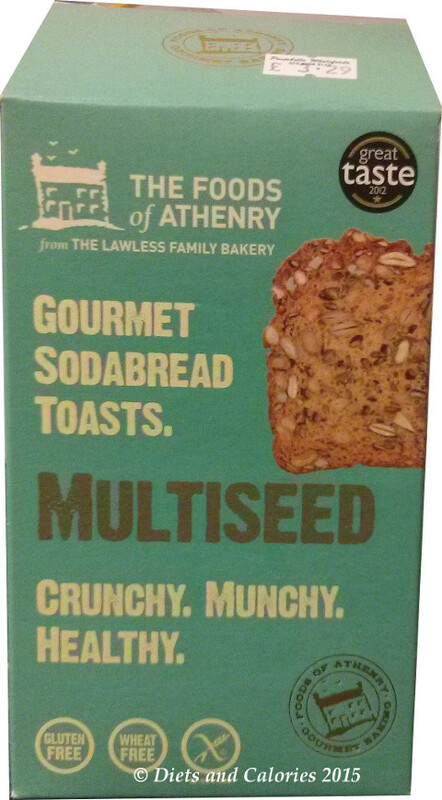 Sodabreads were developed by the Lawless family in Galway Ireland, and they’re handmade on their farm by The Foods of Athernry. In bringing up our family we firmly believed that ‘good food promotes good health’, so we took great care in preparing our own lunchbox snacks and treats. When this way of life turned into a business, we applied that same simple rule to all our delicious products. With an all-natural, additive-free range, packed full of premium ingredients – we believe that less is more. Deliciously crisp and crunchy – our versatile toasts are fantastic on their own, excellent on the cheeseboard and wonderful with your favourite toppings dips or spreads. You can find Gourmet Sodabread Toasts in selected Independent Retailers, Fine Food Stores and Health Stores throughout the UK including PLANET ORGANIC stores London / AS NATURE INTENDED stores London / WHOLEFOOD MARKET stores London. You can also buy them on Amazon or via their website. Nutrition information per 100g (Multiseed): 262 calories, 9g protein, 28g carbs, 4.7g sugars, 13g fat, 2g saturates, 4g fibre, 0.29g salt. Calories per 6g toast = 16. Gluten Free, Wheat Free. Ingredients: Gluten free flour (rice, potato, maize, buckwheat, tapioca), Buttermilk, Multiseeds (26%) *Sunflower, pumpkin, linseeds), brown sugar, treacle, raising agents (mono calcium phosphate, sodium bicarbonate), xanthan gum, salt.